I’m often getting requests for autographed copies of books, but since I rarely keep any stock at home, it’s usually something reserved for book-signing events. Well, I don’t have anything planned before this November’s Equine Affaire, but I do have books in stock! The paperback of Turning For Home – complete with book award sticker! If you’d like a signed copy of my award-finalist novel Turning For Home, now is the perfect opportunity. I have a limited number of paperbacks in stock. Just email me at natalie at nataliekreinert.com to order yours! The cover price is $14.95, plus $5.00 for shipping anywhere in the United States, payable via PayPal. Shipment outside of the U.S. available upon request. You’ll get a nice message and the book signed to you (or whoever you like)! I’m happy to offer this service since so many readers have asked. Are you looking for another of my books with an autograph? Let me know! There will be several other authors there as well: Eliza McGraw will be signing Here Comes Exterminator! and Joanne Beusch will be signing Brightly Shining: The Horse No One Wanted. Find the horse books by the grandstand from 12 PM – 2 PM! Proceeds from our books will benefit the Thoroughbred Aftercare Alliance and Maryland Komen. Preakness Day Credentials and book award stickers! We’ll also be at the races on Preakness Day. This is my first time at Pimlico, and my first Preakness! After four or five Belmont Stakes, I figure it’s time to diversify my Triple Crown portfolio. No word yet on when I’ll be adding the Kentucky Derby to the mix. Follow me on Twitter (@nataliekreinert) and Facebook — I’ll be live-tweeting from the races for as long as my phone signal and battery hold out! I was messing about on the Internet (like we’re all doing, all the time, it seems), and stumbled upon the Kindle pages for each of my books. This isn’t the sales page, but a page where readers’ public comments and highlights show up. It’s a collection of everyone’s favorite lines and scenes. Most of the books had a few different passages highlight, but Turning For Home, my 2015 novel about retiring and retraining a beloved racehorse, had just one passage highlighted — over and over again. I was struck by how many people found that one sentence so relatable. The phrase “heart horses” turns up a lot nowadays. These are the horses who grab hold of us even when we’re trying to make business decisions, or trying to move on with our lives. The heart horses are the ones we can never, ever forget — our connection was too deep. I’ve definitely had two horses who meant the world to me, out of the dozens whom I simply enjoyed, or rode, or made friends with. Looks like a lot of you have had heart horses, too. My favorite promotion piece for Turning For Home – this Instagram friendly square. Launching Turning For Home was my most challenging book launch to date. The fourth book in a series — how do you share that with readers who are new to the series? Compared to Ambition, I barely did any promotional work at all. I just plain didn’t know what to do. After all, I couldn’t exactly send it to equestrian websites and blogs if they hadn’t covered the first few books. A few websites who had declined reading The Head and Not The Heart and Other People’s Horses (because they were racing novels) had been my most enthusiastic reviewers for Ambition — and here I was going back to racing for my newest novel. And not just racing, but responsible racehorse retirement. Other People’s Horses was about horse racing, and while there were a few bad apples, it was largely positive. Racing people liked it; so much so that it was a semi-finalist for the Dr. Tony Ryan Book Award in 2014. Turning For Home deals with retirement, animal rights activists, and the fact that some people just are not doing right by their racehorses. Would it hit a chord with racing publications, or just piss everyone off? Well, at least I had my core readers, right? RIGHT? But what if I couldn’t get the word out to all the readers that had been clamoring for a new Alex novel for the past two years? All of a sudden the year’s worth of work I’d thrown at Turning For Home was looking pretty crazy. Maybe, I thought, I should have spent all that time working on the sequel to Ambition, a book that was fresher in people’s memories — and which had a lot of support from traditional equestrian websites and magazines. A Facebook/Twitter banner letting people know Turning For Home was coming. In the end, I settled for awareness. I designed a few graphics to stick on my various social media pages. I used Amazon’s new pre-order feature for the Kindle edition, so that it could start climbing the rankings in the horse racing category where the other Alex novels already do well. (Happily, Amazon helped out by featuring it in their “Hot New Releases” section for a few weeks.) I tweeted (a little) and Facebooked (a little) and threw out a few notices on Pinterest and Instagram. Just enough to let folks know that the book was happening, and if they wanted to, they could read it! You GUYS! Stop it. I’m blushing. So, all in all, the confusing promotion of a fourth book has turned out okay. I would love to know how much of it was my blog and social media, and how much of it was people clicking on Amazon’s suggested purchase or new release ads, that actually let people know Turning For Home was available. Either way, it’s good to know that I can concentrate on writing, and spend less time worrying about getting the word out about new books. But if you really want to know… look for my next book, Pride, very soon. Yes, it’s the next book in my Eventing Series, which began with Ambition. Yes, Jules has a lot more growing up to do. It should be a fun ride. I’m happy to announce that Turning For Home (Alex and Alexander Book 4) is now available for download at a variety of online retailers, with a paperback to follow soon! Get a grown-up horse book! This new installment of these “Horse Books for Grown-ups,” which began back in 2011 with the publication of The Head and Not The Heart, then continued with the 2014 Dr. Tony Ryan Book Award semi-finalist, Other People’s Horses and the holiday short Claiming Christmas, returns to the dark bay beauty that Alex fell so hard for at Aqueduct Racetrack, The Tiger Prince. The charismatic Tiger has run his last race, and it wasn’t pretty. Alex is faced with an agonizing decision: how can she retire a hot-tempered gelding who has no place on a breeding farm, but is such a pet that he can’t be sold or adopted out? Then, as if life wasn’t complicated enough, another scandal is breaking over the racing industry. Racehorses are found abandoned and starving in the Everglades — and a radical animal rights group pins the blame on Alex. Hate mail and death threats, plus a mysterious new neighbor who is making life downright dangerous, throw Alex’s training career into a tailspin. Stuck on the farm, exiled from the racetrack, angry and shell-shocked, Alex and Tiger have more in common than ever. When a Thoroughbred Makeover event is announced for late spring, Alexander and Kerri both encourage Alex to seize the opportunity and show everyone that she’s fully capable of responsible racehorse retirement. It’s a move that could make — or break — her training career. Turning For Home returns to some of my favorite places: the rolling hills of Ocala, the small-town feel of Tampa Bay Downs. And it takes on one of my favorite subjects, racehorse retirement. That’s actually what got me started in this whole writing game, you know — writing Retired Racehorse Blog back when I had a little Florida farm, some broodmares and foals, and one wonderful gelding that I’d gotten off the track and was training to be an event horse. I actually trained that horse, in part, to prove to myself that I still could do it. I guess in that way, I’m a lot like Alex in this story. Is retraining a racehorse like riding a bike? At some point, muscle memory kicks in, right? It seemed that way for me, when I was out riding Final Call. I used the memory of those rides to write about Alex as she rides Tiger. I hope that helps the story ring true for equestrians — that’s always my number one goal as a writer! The newest Alex and Alexander novel is almost here! Are you ready for the first chapter of the newest Alex and Alexander novel, Turning For Home? Well, I have it here for you! Every racehorse must one day retire from the track, and for Tiger, that day has arrived. Alex isn’t ready for Tiger’s racing days to end, but planning his next career is quickly becoming the least of her problems. An animal rights group is accusing her of involvement in a horse-abuse scandal, and with death threats arriving daily, Alexander fears for her safety. Suddenly Tiger’s not the only one heading back to the farm — Alex is stuck at home, too, with strict orders to stay away from the racetrack. Both horse and rider would rather be racing than hacking around the farm. A Thoroughbred makeover event seems like the perfect distraction, but as the activists ramp up their protests, Alex realizes she’s competing for more than just a blue ribbon. She’s fighting for her own reputation. This horse show could make — or break — her future in horse racing. The long-awaited update to the Alex and Alexander horse-racing series is almost here! You can now pre-order the Kindle edition of Turning For Home (Alex and Alexander Book 4) from Amazon, with the digital edition releasing wherever ebooks are sold on March 3rd, 2015. If you’ve been impatient to read what happens next with Alex, Alexander, and the Thoroughbreds of Cotswold Farm, your wait is almost over! What happens when a racehorse retires? That’s the central question of Turning For Home, as Alex is forced to confront the myriad worries of retiring, retraining, and rehoming racehorses — specifically, her own beloved Tiger. Alex isn’t ready for Tiger’s racing career to end. Tiger doesn’t seem to be ready, either. Then, she finds herself embroiled in a horse-dumping scandal that makes Tiger seem like the least of her concerns. Stuck on the farm, in exile from the races, Alex is bored and angry and in dire need of a distraction — just like Tiger. That distraction comes in the form of a Thoroughbred Makeover event, designed for showcasing riding horses fresh off the racetrack. Alexander, busy with Personal Best, Luna Park, and the rest of the Cotswold racing string, urges Alex to give it a shot with Tiger. In the midst of all this turmoil, the life cycle of the Thoroughbred farm continues on — breeding, foaling, training, racing. 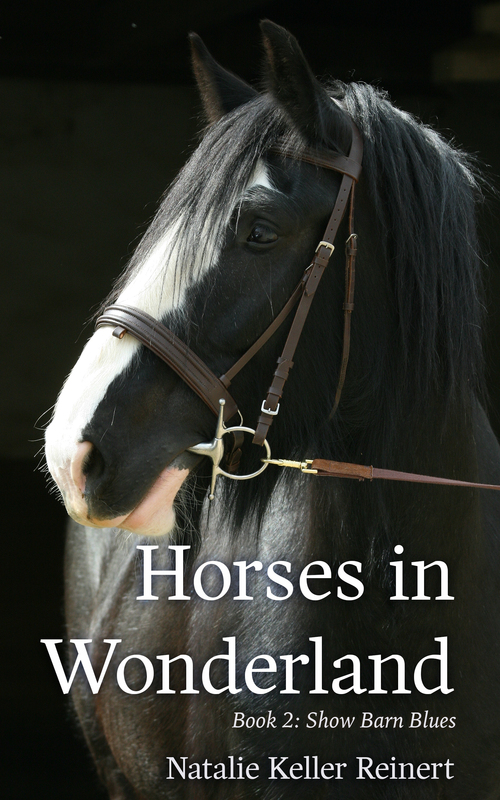 It’s a novel jam-packed with all the rich nuances of the equestrian life — another horse book, for horse-people. Stay tuned here for updates on the release of Turning For Home (including an upcoming paperback edition) or get your pre-order in at Amazon.com today! It’s time to go back to Ocala and Cotswold Farm with Alex and Alexander.